In 25 years, Wynn has released at least that many albums and has seen over 300 of his songs recorded. He has played over 2000 shows in more than 25 countries. His songs have been recorded and/or performed by REM, Luna, Concrete Blonde, The Black Crowes, Yo La Tengo and Eleventh Dream Day, among others; his “That’s Why I Wear Black” became the #1 single of 1993 in Norway as the leadoff track from the debut album by Somebody’s Darling. He has been prominently featured in Rolling Stone, Mojo, Uncut, Entertainment Weekly, People, The Los Angeles Times, New York Times and countless other publications all over the world. 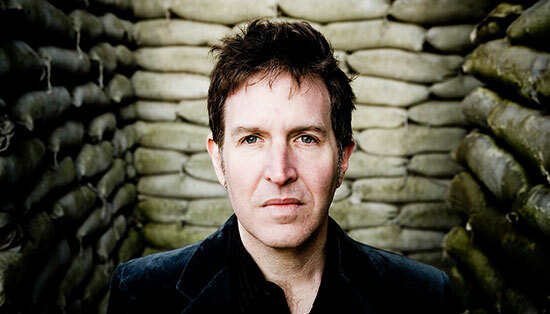 Or maybe you know Wynn from his groundbreaking work with The Dream Syndicate, a band that–along with REM and the Replacements–practically invented the American indie rock scene of the 1980s. Perhaps you know Wynn from his critically acclaimed solo albums of the 1990s which were fixtures on many Modern Rock radio stations across the country. Or it could be from his highly touted side-project Gutterball which by its fifth gig found itself signed to Mute/Elektra and on a national tour with The Black Crowes. Or maybe from his recent “Desert Trilogy” and the near-legendary shows with his current backing band The Miracle 3. Or maybe you tuned in for the first time when he played on the Late Show With David Letterman as part of The Baseball Project earlier this year. Steve Wynn was born in Santa Monica, California in 1960 and got his first guitar (a nylon-string acoustic) when he was nine, shortly after which he wrote his first song “Sing My Blues”. He formed his first band “The Light Bulbs” that same year and the band made the circuit of parties and school functions; the band’s oldest member was ten years old. By the time he was 13, Wynn had played in bands with such colorful names as Purple Passion and Sudden Death Overtime, alternating between his own early originals and songs by Neil Young, The Rolling Stones and The Who. During his high school years, Wynn entertained notions of becoming a sportswriter but the excitement and immediacy of the punk rock explosion of 1977 brought him back into the world of songwriting and performing. He found himself writing and playing guitar for UC Davis (near Sacramento) New Wave pioneers “Suspects”, a band for whom Wynn wrote over 100 songs, none of which he has performed since. A move back to Los Angeles with Suspects lead singer Kendra Smith was the first step towards the formation of The Dream Syndicate, the band with whom Wynn would gain national and eventually international acclaim. The Dream Syndicate played together for the first time in December 1981 and within three weeks had recorded its self-titled first EP. The record was released in April 1982 and followed six months later by the band’s debut album “The Days of Wine and Roses“, an album which fans and critics alike still consider one of the best and most important rock albums of all time. Those early years are represented here by “When You Smile” and “That’s What You Always Say,” songs which have been covered, respectively, by Concrete Blonde and Luna. The band was almost immediately signed by A&M Records for whom it recorded the landmark “Medicine Show” (the title song opens this compilation), a record that was recently named one of the 40 best rock albums of all time by the London Guardian and whose songs have been covered by REM and The Black Crowes among many others. In 1990 Wynn came back with his first solo offering “Kerosene Man,” an album of incredible diversity that showed Wynn’s enormous growth as a songwriter and record-maker. The songs “Carolyn” and “Tears Won’t Help” were among the most-played songs that year on Modern Rock radio stations and his video for “Carolyn” was in regular rotation on MTV for six weeks. The follow-up “Dazzling Display” was Wynn’s most elaborate production to date, a dizzying synthesis of the best rock music of the previous 30 years featuring the talents of, among others, REM’s Peter Buck, Concrete Blonde’s Johnette Napolitano and members of The Bangles, The Turtles and the touring bands of Lou Reed and Tracy Chapman. A four-day writing vacation in Richmond, Virginia with the House of Freaks’ Bryan Harvey turned into the side-project supergroup Gutterball who released two albums, garnered overwhelming press response and built a frenetic cult following; the Black Crowes took the band out as its opening act even before the first Gutterball record was released. Not one to stand still, Wynn followed the success of Gutterball with the more introspective “Fluorescent“, an album whose single “Carelessly” picked up heavy radio play throughout the US and Europe. In 1994, Wynn moved to New York City. He harnessed the excitement and energy of his new home in his record “Melting in the Dark“. The two albums that followed,”Sweetness and Light” and “My Midnight“, found Wynn settling into the sound that would define the next phase of his solo career. In 2001, Steve went to Tucson and recorded the double album “Here Come the Miracles” which was released to overwhelming critical acclaim. The album was seen as a stunning comeback and appeared on many year-end critics’ surveys along with winning Best Alternative Rock Album by the American Federation of Independent Music. The album was followed by “Static Transmission” and “…tick…tick…tick“, both also recorded in Tucson with his new backing unit “The Miracle 3” and which were viewed as part of a “Desert Trilogy” that is seen by many as the best work of his career. But Wynn has never been one to settle into an easy or predictable groove. Since the last of the desert trilogy he has recorded “Cast Iron Soul“, a new Danny & Dusty album with Green On Red’s Dan Stuart, joined forces with his wife and drummer Linda Pitmon and legendary Spanish producer Paco Loco to concoct the twisted pop side project “Smack Dab“, and collaborated with the Walkabouts’ Chris Eckman in Slovenia on the lush and lavish “Crossing Dragon Bridge“, a record that made up a tandem of new releases in 2008 with “The Baseball Project“, a baseball song cycle collaboration with Pitmon and also Scott McCaughey and Peter Buck of REM and the Minus 5. In the midst of such a prolific recording career, Wynn has still found time to average over 100 shows a year all over the world. He has found himself as welcome in Rome, Oslo, Athens, Brussels, London and Madrid as he has in Los Angeles, New York City, San Francisco, Chicago and Boston. And for the devoted fans he has made in these and many other cities, his extensive discography of music reflects the consensus among fans: that Steve Wynn is one of the most adventurous, accomplished and exciting songwriters of the last few decades. If all of this is still news to you, just put on this cd and get ready to join the legions of people who have enjoyed Wynn’s dazzling display of songs over the last 25 years.